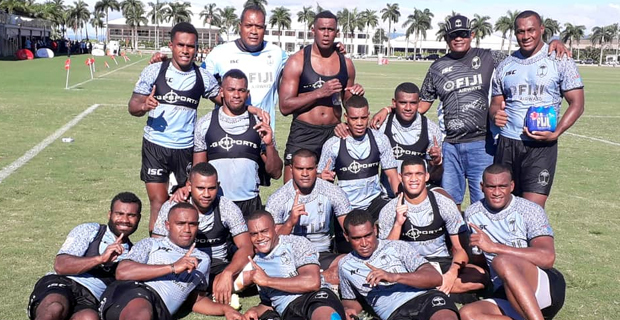 Fiji Airways Men’s National 7s Coach Gareth Baber has named the 13 member squad that will represent Fiji to the Hamilton and Sydney 7s tournaments. The squad includes Terio Tamani, Paula Dranisinukula and Josua Vakurinabili. It also excludes Amenoni Nasilasila who was suspended by the Fiji Rugby Union and Vatemo Ravouvou who was dropped from the training squad for indiscipline. Kalione Nasoko will lead the side as they prepare to defend the title in Hamilton. The team will depart for Hamilton on Monday. Fiji will take on Wales in their first match of the Hamilton 7s at 10.52am next Saturday, they will then face Argentina at 2.42pm and will take on Australia at 6.52pm in their last pool game next Saturday. The Cup quarters will start at 10.36am next Sunday, the semifinals will kick off at 3.16pm and the final will start at 7.10pm next Sunday.